ADJ has given its US website a makeover, now boasting an intuitive layout, sleek design and fresh content; encouraging a more interactive experience for customers and visitors. The site also sees ADJ uniting its americandj.com and americanaudio.us websites under a new URL: www.ADJ.com. The reinvented site takes on a clean design and predominantly white colour scheme; a scroller-header making new products instantly browsable; and a catalogue of the latest news items, featured videos and select ‘ADJ Experience’ pieces taken from the company’s monthly NewsWave email newsletter. ADJ has already compiled 500+ articles on the site, with users encouraged to leave comments and share the articles via social media; giving mobile DJs and other industry people a place to share ideas, read articles and view video content. 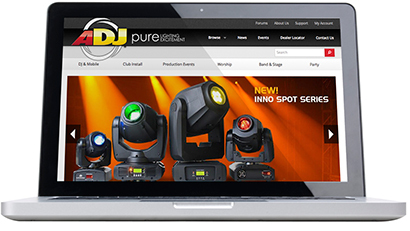 ADJ’s latest changes have also seen the previously independent ADJ and American Audio websites brought together under one online identity; allowing visitors to view both audio and lighting products from both brands in one convenient place, as well as read news stories and press releases relating to ADJ’s involvement in both sectors. The site’s new layout, which now divides products by market, also makes it easier and quicker for mobile DJs to find the products best suited to their needs. Great for DJs on the move, the accessible new site is mobile friendly and compatible with smartphones and tablets; the ADJ Europe website has also been updated to match the look of the new site, offering the same interactivity and ease-of-use.